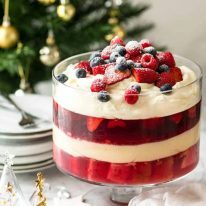 This trifle will look smashing on your Christmas table!!! 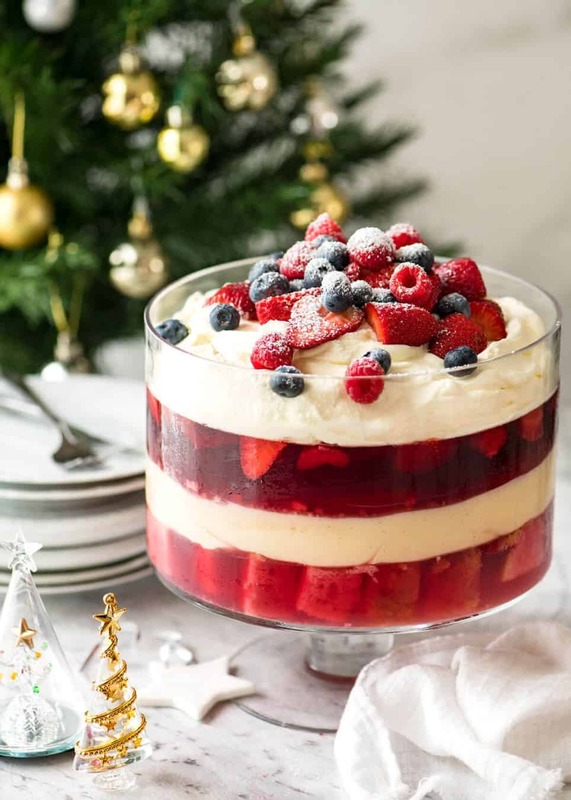 With layers of custard and jelly, piled high with cream and fruit, the one thing that will take your Christmas Trifle to another level is to use real cranberry juice and flavourless Aeroplane jelly, instead of artificial flavoured jelly. It’s super simple – watch the video! The first time I made trifle, I used raspberry flavoured Aeroplane jelly and store bought custard. It looked so fabulous, I was beaming with pride. 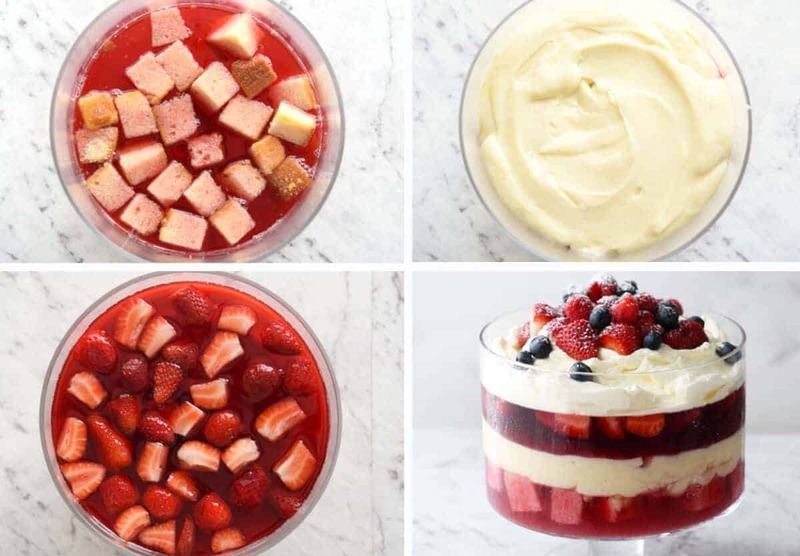 Blinded by the beauty of the trifle, I completely forgot the first rule of cooking – it doesn’t matter how pretty it looks or how good the photos are if it tastes meh. One big bite, and I wrinkled my nose with distaste. The jelly flavour was just so incredibly artificial, it was really off-putting because its artificial-ness is such a stark contrast to all the other flavours going on in the trifle. Now before you go thinking I’m some kind of food snob, let me just say this – I actually don’t mind Aeroplane jelly on it’s own, there’s something sentimental about it. And I thoroughly encourage you to use store bought custard if you are pressed for time (though homemade is really sooooo good!). BUT PLEASE DO NOT USE FLAVOURED AEROPLANE JELLY IN THIS TRIFLE!!!! I promise you, it is so crazy simple to make real juice flavoured jelly! All you have to do is use flavourless Aeroplane jelly (called “Create a Jelly“, sold at Woolies, Coles etc) instead of flavoured Aeroplane jelly, and use cranberry juice instead of water. Yep. It’s as simple as that. And the difference is phenomenal. I think the reason why it makes such a difference to use real Cranberry Juice for the jelly instead of flavoured Aeroplane Jelly is because there is so much of it in the trifle. Also, the jelly is slightly more concentrated in flavour than when you make it per the packet directions because the liquid to crystals ratio is lower, to ensure the jelly is firm enough to withstand the weight of everything piled on top of it. Other than that, I have no other trifle rules. In fact, I’m pretty relaxed about everything else. Use whatever cake you want for the base – even Christmas cake. Use homemade or store bought custard. Use any fruit you want – even canned is fine. I’d even say it’s pretty ok to use whipped cream out of a spray can over using flavoured Aeroplane jelly!!! If you want quite neat layers, like depicted, please do follow the recipe carefully for each layer. In my trifle making life, there have been some not-so-pretty trifle efforts (albeit tasty!). Mainly bleeding between the layers, and jelly that set too much before ladling onto the custard, so it looked broken and split, rather than a clear jelly to show off the fruit in that layer. If you’re catering for a large group this Christmas and/or you want a dessert you can make days in advance, this Christmas Trifle is ideal! Just assemble the layers then refrigerate. 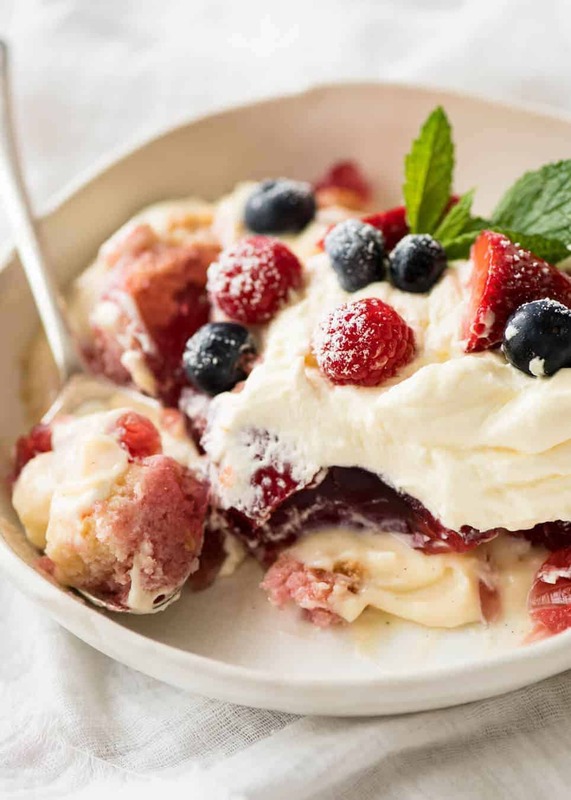 The only thing you’ll need to do on the day is whip the cream and pile on the fruit. 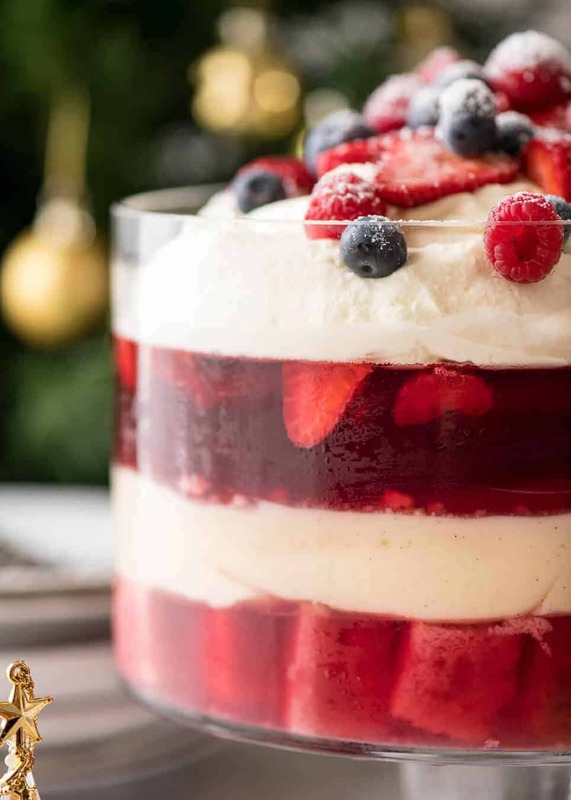 Layers of Cranberry Jelly and custard, topped with cream and berries makes a magnificent festive centrepiece. Making Cranberry jelly instead of using artificial flavoured jelly makes an phenomenal difference to this trifle! See Note 5 for how to make the jelly without flavourless Aeroplane Jelly. Recipe VIDEO below. Cut cake into 3 cm / 1.2" cubes. Cover bottom of 3.5 L / 3.5 qt trifle dish with cake (might not use all) and sprinkle with liquor or juice. Optional extra: Scatter over 1/2 to 1 punnet halved strawberries (this is not in ingredients list). Bring 3 cups of the Cranberry juice to a boil in a large saucepan. Add jelly, mix until dissolved. Add remaining juice. Pour HALF the cranberry jelly liquid carefully over the cake in the trifle dish. Refrigerate uncovered for 1.5 hours until it is partly set – still quite soft, but not watery (ie if you gently place a strawberry on it, it will stay on the surface). Pour remaining jelly in a bowl and leave on the counter (do not refrigerate). Meanwhile, make the custard (see below). Remove trifle from fridge. Spoon over the custard, smooth surface, press on glass to seal (stops jelly bleed). Refrigerate for 1 hour until surface has firmed up a bit - just enough to hold the jelly (jelly is soft so custard doesn't need to be fully set). Put remaining jelly in the fridge at the same time (to thicken a bit, but not too much, see video. If sets too much, next jelly layer doesn’t set clear, will look broken and bubbly). CHECK jelly at 30 minutes, just to ensure it's not setting too fast. Remove trifle and jelly from fridge. Jelly should be sloppy. Carefully spoon over jelly, smooth surface. Scatter over 1 punnet halved strawberries (or half each raspberries and strawberries). Refrigerate for 3 hours+ (can leave in fridge for 48 hours, until ready to assemble). Cream: Beat cream, sugar and vanilla until softly whipped. Once jelly is set, just before serving, top with cream, then pile over remaining berries. Dust with icing sugar. Bring milk, ¼ cup sugar and vanilla to a simmer in a large saucepan over medium heat. Do not boil. In a large bowl, whisk together remaining ¼ cup sugar and yolks, then whisk in cornflour until smooth. While whisking, carefully pour in about ½ cup of milk mixture. Once mixed in, slowly pour in remaining milk while whisking. Once incorporated and smooth, pour back into saucepan. Return saucepan to stove over low heat. Whisk constantly until it becomes thick and custardy – this will happen quite quickly, about 45 seconds (ie it is liquidy when you start, then suddenly it thickens). Once thickened, remove immediately from heat – it will continue to thicken. 1. CAKE: Any cake will work fine with this. 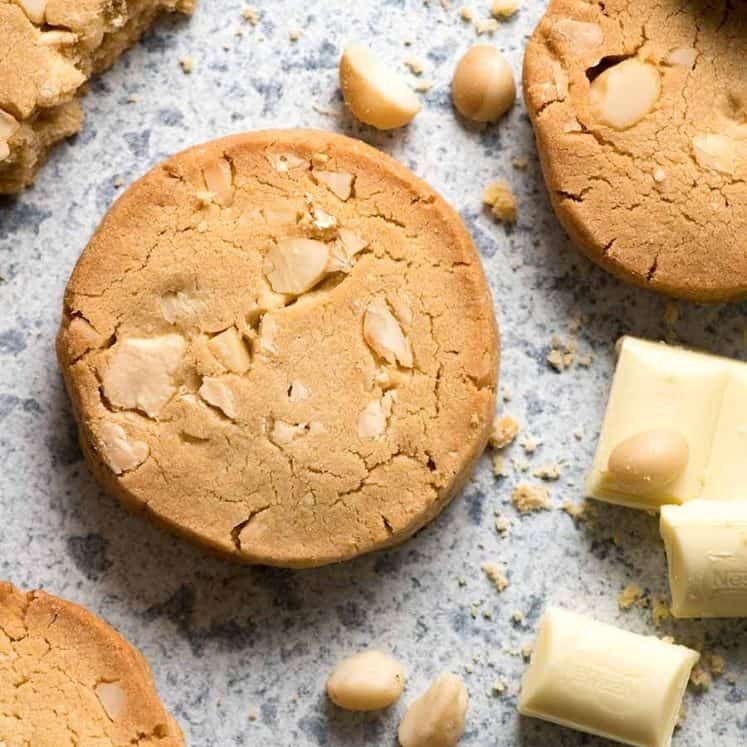 Pound and Madeira are ideal and readily available at supermarkets. Christmas Cake is also great. 2. JELLY: The flavourless “Create a Jelly” Aeroplane jelly is sweet. It's sold at Woolworths, Coles etc in Australia. So it’s important to use sugar free / reduced sugar Cranberry Juice (I use Ocean Spray Cranberry Light - No Added Sugar), otherwise your jelly will be too sweet. 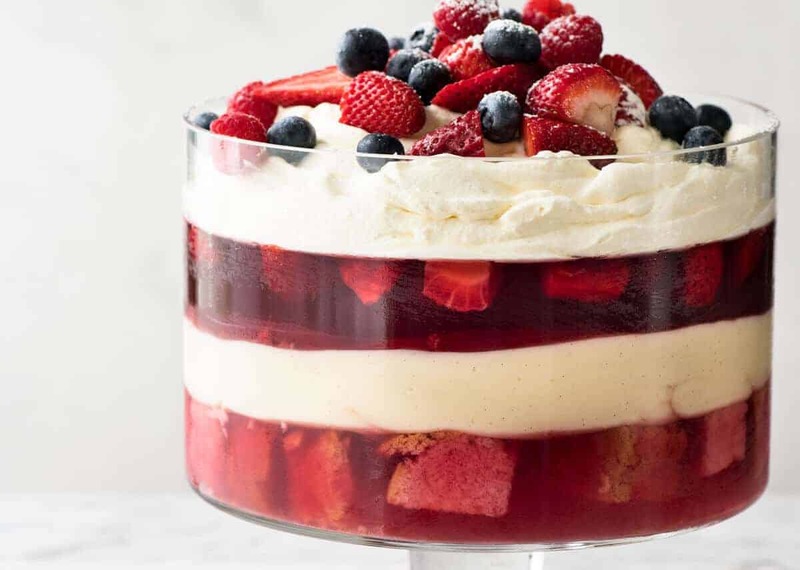 You’ll find trifle versions made using raspberry and strawberry flavoured Aeroplane jelly. I tried it once and really didn’t enjoy it, I found it too artificial. I really think it’s worth the small effort of making a jelly made using real Cranberry Juice, the flavour difference is astonishing, it’s real. If you can't find Flavourless Aeroplane jelly, see Note 5 for how to make the jelly using plain gelatin. 3. STORE BOUGHT CUSTARD: I would use store bought custard over flavoured Aeroplane Jelly, to save time. Add a dash of vanilla to freshen it up. Make sure you get DOUBLE THICK Custard (Pauls is good, Woolies, Coles etc in fridge section). 4. VANILLA BEAN PASTE has little black specks in it, like when you use an actual vanilla bean. It's optional, you can just use normal vanilla! 5. GELATIN JELLY: Use this if you don't have Flavourless Aeroplane Jelly where you are. This is made using normal gelatin powder. 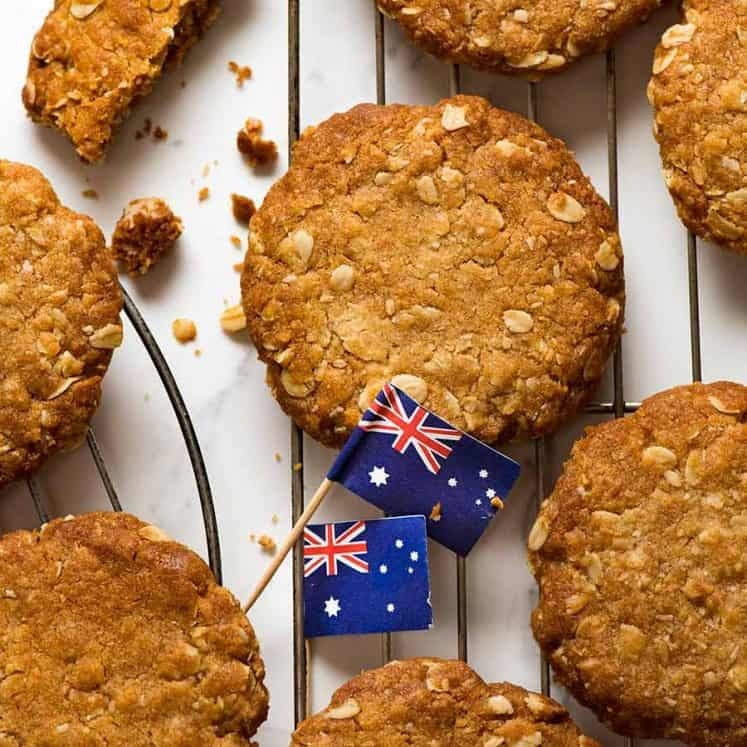 I use McKenzie's here in Australia, small tub sold in the baking section of supermarkets. If using gelatin, you MUST use Cranberry Juice with sugar added, called Cranberry Classic here in Australia. Otherwise your jelly won't be sweet at all. Cranberry Juice is sold in the aisles. 1. Put room temperature cranberry juice in a bowl, sprinkle over gelatine powder. Whisk until mostly dissolved. 2. Pour in hot cranberry juice. Whisk until gelatin is fully dissolved. Use per recipe. 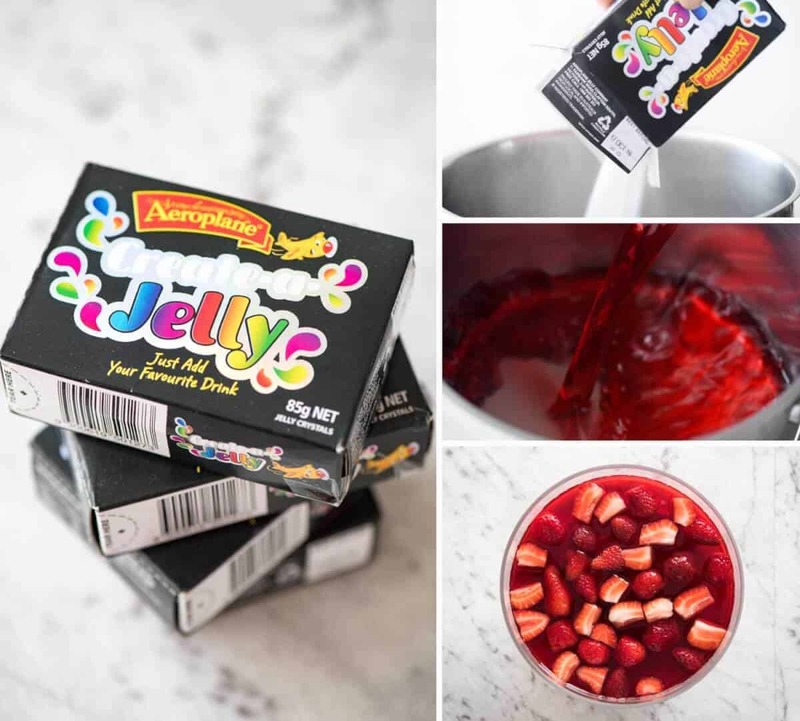 This jelly requires more liquid because there’s about 1 1/2 cups of Aeroplane jelly powder, so you need more liquid volume using gelatin powder. Cranberry Jelly made using gelatin needs to use normal cranberry juice ie not sugar free because otherwise the jelly is not sweet enough. 6. CUSTARD: You want the custard mostly cooled but not set. When slightly cooled, it is like soft whipped cream so you can spoon it on the trifle and it spreads smoothly. If it cools too much and sets, just use an egg beater and beat until smooth. Once refrigerated in the trifle, it thickens even more – it’s not like a firm set custard that’s cut-able into clean pieces (like firm tofu), it is softer than that, it's more like silken tofu ie. you can cut it cleanly but it's wobbly and soft. 7. I feel bad providing the recipe reference but I must because it is where the original idea came from and the end result looks so similar. I made this trifle recipe from Taste.com.au as written, I had problems with untidy layers / bleeding and I really did not enjoy the flavour of the artificial jelly. I also found the trifle didn't fill a standard trifle dish enough. So I used this recipe as a reference point, but reconstructed it pretty much from scratch. 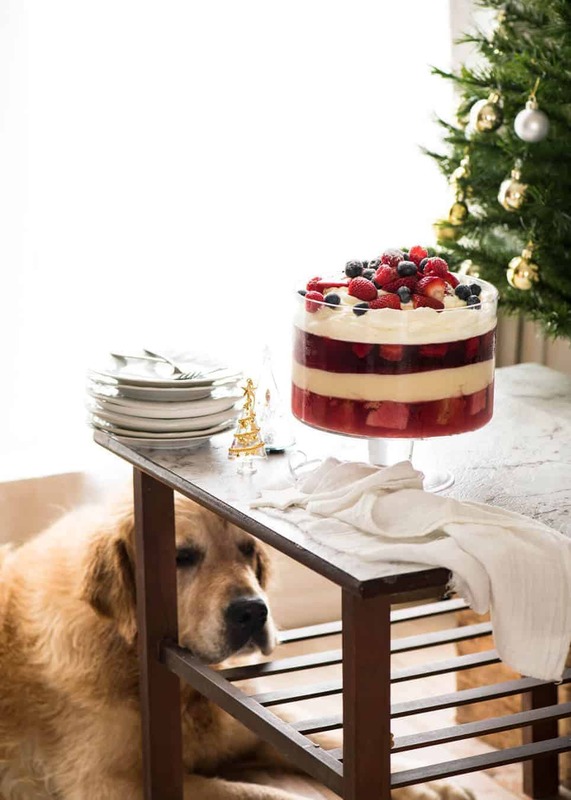 All I want for Christmas is for this Trifle to fall off the table. 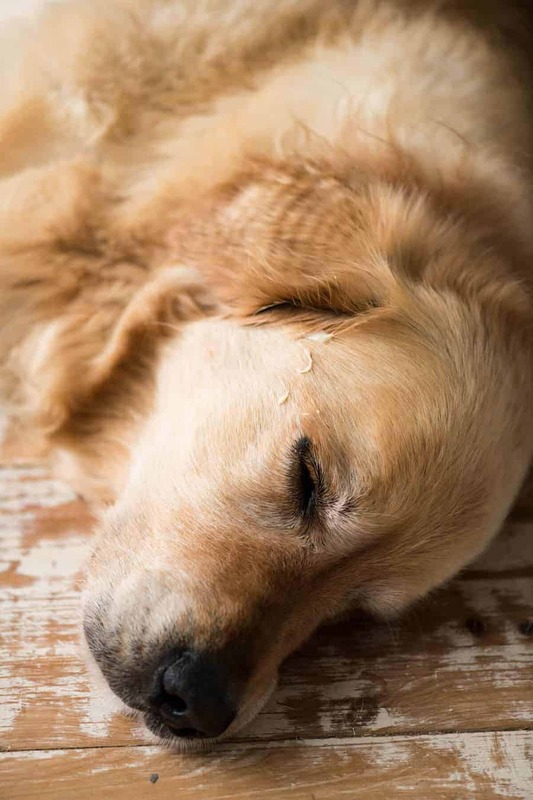 Santa won’t be making good on that wish, but while he was sleeping, Santa accidentally flung some custard on his face and he didn’t even stir…. Made this for our Christmas lunch today and it is absolutely delicious. This will be my go to trifle recipe going forward. And the cranberry jelly – I was going to take the shortcut and just use flavoured Aeroplane jelly, but so glad I didn’t. .
Nagi you are a life saver…..I have just decided the day before Xmas to attempt some of your recipes for my Xmas lunch table. However I realized I did not get the cranberry juice for my trifle so I want to know can I replace it with a berry juice that is not smooth (has tiny bits of berry) or must it be a smooth juice! Help!! Hope you having a wonderful holiday season! Thank you Nagi for all of your wonderful recipes and video’s. I made this trifle last year and it was a big hit. Hope that you and Dozer have a great Christmas. Will be making your trifle for Christmas dessert. Love your videos, always make things so much clearer. And Dozer, my favourite internet dog !! Merry Charistmas, Nagi & Dozer! Thank you for all the smiles, chuckles and the GREAT recipes this year! We are having roast leg of lamb from Costco,only has Australian lamb. Made this last year for Christmas, it was a real hit, getting requests to make it this year. Woot! Awesome Sandra, hope you have a great Christmas! I went to buy the unflavoured jelly on Saturday from Woolies at Belrose and was told but a member of staff that it has been discontinued. Loved the idea – maybe some gelatine and sugar with the cranberry juice????? Peut on juste prendre du jello avec notre saveur préféré ? I am literally making this (waiting for custard layer to set) as I type. I’m wondering why the first jelly layer is set to soft as opposed to firm? Considering the second jelly layer is soft and sloppy… I found after 1.5 hours in the fridge the soft set in the first layer still allowed a little bleeding when I layered the custard 😩 I think I prefer a firm set at the bottom for a better foundation. Your thoughts? Anyone making this should pay close attention to the rapidly quick thickening of the custard, it really did happen right before my eyes and I think mine ended up (although workable) a little too thick compared to Nagi’s softer thickness as per video. Hope this doesn’t affect the end result as I’m aware the custard will continue to set overnight.